Posted by Eric Miller on Monday, February 15th, 2010 at 7:46am. Just before the end of the year a 12th floor unit sold at Portofino, which is located at 77 South Birch Road, Fort Lauderdale. 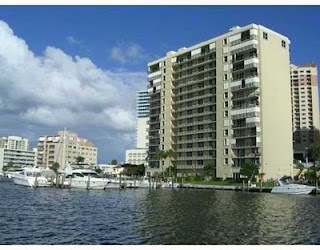 This building sits directly on the intracoastal waterway, on the beach side, close to beautfiul Las Olas. It is a great smaller building with only 52 units all of which go through the building, east to west. Most have a partial ocean view on the east side (some have been partially blocked by new constrcution over the years) and a downtown, intracoastal view on the west side. In most units the western view is from the kitchen area of the units. Over the years since its constructon in 1982 the building has been beautifully maintanined and renovated. The pool area, gym, and lobby have all been redone. The building does have dock space for up to 60 foot boats, however there is a waiting list for these docks when they become available. The 12th floor unit that sold was 1692 square feet and sold for $425,000, which was a sales price of $251 a square foot.In 2007, similar units were selling for $291 a square foot. This shows that in two years the building has declined approximately 16%. This number is less than the overall market and should be expected when a building is in a superior location, and has been well maintained. Currently there is only one unit for sale in the building which again is a sign of a great Fort Lauderdale property. The building does allow small pets. If you are interested in seeing this property call Eric Miller and Associates, we are here to help with all your real estate needs in the Fort Lauderdale area.